"Dr. Sloane Guy is a great doctor. I was lucky to find an experienced professional like him." "Dr. Guy repaired my mitral valve via a minimally invasive robotic procedure on May 5, 2015. I selected him per the recommendation of my cardiologist, even though others were insisting I go to the Cleveland Clinic on its reputation and high published ranking. Two months after my surgery, I am very happy and satisfied with my decision. The operation had the best possible outcome. Even though my mitral valve was severely impaired, resulting to a high degree of regurgitation, Dr. Guy was able to avoid a mechanical valve replacement, and a sternotomy. Two weeks after the operation, I could walk outdoors for 1/2 to 1 hour at a time, twice a day. Test performed by my cardiologist showed a normal valve repair, and I returned to work less than six weeks after the operation. I am currently making great progress at my cardiac rehabilitation program. Dr. Guy is one of few surgeons in the country and the world who have mastered the complex and delicate minimally invasive robotic mitral valve surgery. I wholeheartedly recommend him to anyone who needs this operation. "Dr. Guy was a fantastic choice to perform my wife's Mitral Valve Repair via Lateral Endocscopic Approach using Robotic assistance. When we met Dr. Guy he was absolutely the most up front surgeon we talked to (we talked to 3 others in person or on the phone). Never once did he down play the way other surgeons were operating and recommended the names of those we should talk to if we were looking for more traditional approaches. He was straight forward, concise, knowledgeable and made time to talk to us, even staying late on a Friday after a surgery to answer any and all questions we had. During the surgery he made sure his entire team kept me and my wife's family up to date on the surgical proceedings, gave us a detailed description of what occurred during the surgery when he was finished and followed up with us daily until we were discharged. We left the hospital after 4 days and are recovering daily in the comfort of our home. I would recommend Dr. Guy and the staff he has assembled to anyone." "Dr. Guy is friendly, honest and truly wants what's best for his patients. He fully explained my procedure and really put me at ease by being direct and honest. Dr. Guy saved my life." "Dr. T. Sloane Guy is fantastic. He is right to the point and tells you each step you will go through. He does extensive testing before hand, which is good because it saved my life. He is very caring. I was up and around in 3 weeks (my other doctors told me 3 to 6 months). I would recommend him to anyone who needs heart surgery." "Dr. T. Sloane Guy performed aortic valve replacement surgery using a minimally invasive 3 inch cut procedure.The surgery was brilliant and I'm back university teaching full time. Dr. Guy is a caring, compassionate, skilled surgeon." Thanks to a verified patient recommendation, this surgeon has been included in our Surgeon Finder as an "Unregistered Surgeon". This surgeon does not have any association with this website, its educational efforts or its patient-advocacy initiatives. To see a list of "Registered Surgeons", please click here. 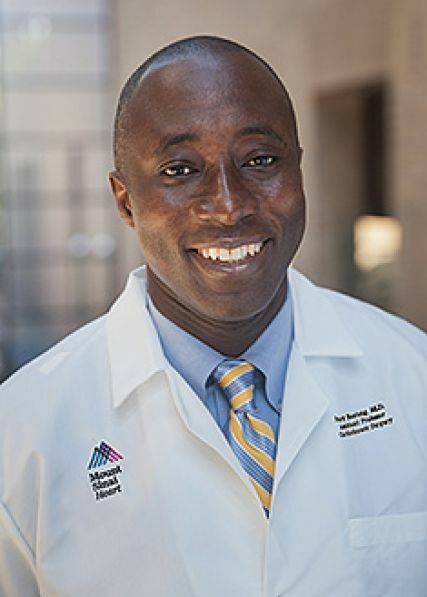 "Dr. Boateng and Dr. Adams and all of the Mount Sinai team made a huge difference to my health. Thank you so much, seems that you gave me a second chance to live and function."